In the middle of my moving frenzy, Alison gifted me with this lovely (literally) award. Accept the award, post it on your blog together with the name of the person who has granted the award, and his or her blog link. 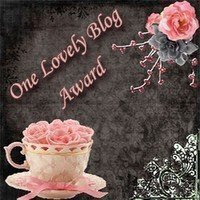 Pass the award to 5 other blogs that you’ve newly discovered. Remember to contact the bloggers to let them know they have been chosen for this award. Herbaholic's Herbarium - This may be cheating somewhat, because this is the person who awarded Alison the award in the first place, but her blog is new to me and I love it! Now that I have someplace to plant it, an herb garden is definitely on my "to do" list. Camp Runamuck - Theresa's blog is fairly new for me too. I believe she found me first, but I've enjoyed her blog ever since. We have quite a few things in common, which makes reading it all the more interesting. Life Looms Large - I'm not sure how long I've been visiting Sue's blog. It's very heavy on inspirational weaving content, with a few other interesting things thrown in for good measure. Woodyarn - I know Margreet through the Online Guild, but didn't know she had a blog until just recently. Primarily she is a weaver, but dabbles in other fiber activities as well. A History of Colour - I know Debbie from the Online Guild as well. (Actually, that's how I know Alison too :) Debbie is not only a natural dyer, but she is an historical dyer as well. Her blog is fairly new, but already very informative. Thank you so much! And it was quite fun to go through your links on this post and see all the wonderful sites I didn't know about. And YOU are so deserving of this award. How is the moving frenzy going? Only to be followed by the painting and unpacking frenzy no doubt. Lucky you, a whole new nest for ideas! A belated thank you for this award! I've been waiting to pass it along because my husband has been starting a blog and I wanted to give him a chance to post a little bit before I gave him an award! I probably could have thanked you without waiting for him though!! !